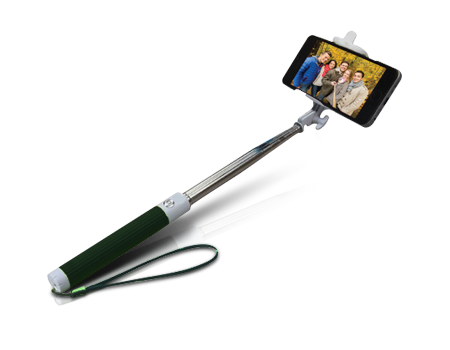 The Selfie Stick by GabbaGoods is the newest and trendiest way to snap a photo! The Selfie Stick by GabbaGoods is the newest and trendiest way to snap a photo! Whether you want the flexibility to take great self portraits, get a birds-eye view of the action, or get all your friends into the picture, this Selfie Stick makes it easy! Use it with any Bluetooth-enabled smartphone that has a built-in camera. The Bluetooth connection is super easy, and there is no app required with any Apple® or Android™ device. The Selfie Stick by GabbaGoods has a foldable phone mount that makes it portable and compact, allowing you to carry it around wherever you want to go! When you're done using it, just fold it and throw it in your bag or pocket. Offer ends 6/25/2015. Select locations. Online ends 6/25/2015 at 6:00 PM PST. $10 discount off iStabilizer Monopod Selfie Stick or #The Selfie Stick by Gabba Goods. $5 discount off #The Bluetooth Selfie Remote by Gabba Goods. Accessory price may vary by location. Wireless synching via Bluetooth® req's compatible device. Discount is not combinable or stackable w/other offers or discounts. Offer, terms and restr's are subject to change & may be modified, discontinued, or terminated at any time without notice. Other restr's may apply.